700 to 6000 MHz! Werlatone's new broadband, 40 dB Dual Directional Coupler, is conservatively rated at 250 W CW, and offers excellent electrical performance. This compact design, measuring just 2 x 2 x 1.06”, operates with less than 0.2 dB of insertion loss, and tight coupling of ± 1.0 dB max. Rated Mismatch Tolerant®, the C10117 will tolerate a full reflection, at rated power. High Power, Efficiency, and Bandwidth! 700 to 6000 MHz! 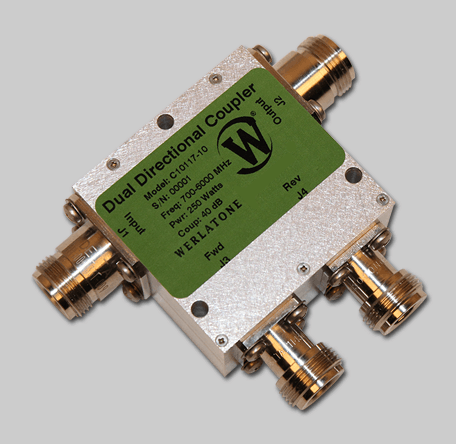 Werlatone’s new broadband, 40 dB Dual Directional Coupler, is conservatively rated at 250 W CW, and offers excellent electrical performance. This compact design, measuring just 2 x 2 x 1.06”, operates with less than 0.2 dB of insertion loss, and tight coupling of ± 1.0 dB max. Rated Mismatch Tolerant®, the C10117 will tolerate a full reflection, at rated power. High Power, Efficiency, and Bandwidth!